Linvilla Orchards is transforming into a festive wonderland from December 1st to the 24th for Christmas Around the Farm. Come see the larger than life Christmasland decorations and displays and pay a visit to the animals dressed in their winter coats! The Christmas Shop and Garden Center will have all your favorite winter accessories, including wreaths, freshly cut trees, greens & holly, decorations, fruit and gift baskets, Christmas gifts, hot mulled cider and children's crafts. Santa Claus will also be making special appearances throughout Christmas Around the Farm on Saturdays and Sundays from 1 p.m. to 3 p.m., so make sure to bring your camera to capture all the excitement! Still looking for more holiday cheer? Climb aboard one of the Wassailing Caroling Hayrides on December 1st, 8th and 15th and 22nd at 5 p.m. and 6:30 p.m. Sing all your favorite Christmas carols in the crisp winter chill, followed by a bonfire, marshmallow roasting and hot apple cider to keep your spirits warm. 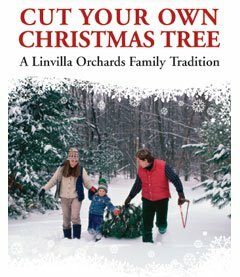 Linvilla Orchards also offers the opportunity for you and your family to cut your own Christmas tree! Enjoy a hayride out to their Christmas tree fields to find the perfect tree for your holiday season. Saw it down yourself or ask one of Linvilla's friendly staff to do it for you. Linvilla is always there for all your holiday needs and entertainment, so come on by this Christmas to see why everyone is saying, "I love that place!"